Yes, my folders are in alphabetical order. 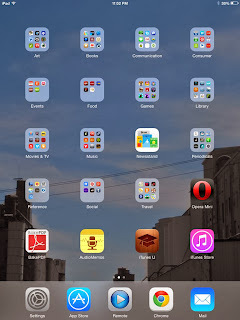 Due to overwhelming demand (by which I mean, two of my Twitter Twerps asked their timeline for app recs, I replied, and they said, "thanks") I am finally posting my recommended apps for iPad. The main things I use my iPad mini for are art, reading, games and social media, with the occasional information look-up. I guess it's a big debate as to whether iPads can be used for content creation, to which I answer - I can, so who are you to tell me differently? I don't write on my iPad except for the occasional blog edit, but at work I use it for note-taking and file storage. Colorsplash does just one thing, but it does it really well. It makes a photo black and white, and you touch parts of the photo to bring color back to the selected area. You can add photos from the iPad, Flickr, Instagram, Picasa, etc. and send them to social media. It also looks really, really cool. Photoshop Touch is pricey for an app at $10.00, but it's a lot cheaper than $20/month. You have a lot of options from the desktop version - eraser, lasso, magic wand, stamp, levels, curves, layers and 36 filters. The main thing it lacks is paths for easier removal of unwanted elements, but that's a lot to ask for in a mobile app. I was able to do this quick and dirty photo manipulation on my lunch hour. If all you want to do is punch up your photos a bit, Photo Editor by Aviary is easy and free. I've started to realize just how much I read online. It is just not comfy to read for hours on a desktop. For reading books or those long New Yorker articles I find the e-ink of my Nook Simple Touch much more easy on the eyes, but for short articles or blog posts, the iPad is good, as long as you have some way to get rid of all the ads and links cluttering up the average web page. I was mad as hell about Google Reader going away, but now I like Feedly better for all my many blogs, webcomics, and Flickr groups. The killer feature is the "remove clutter" button which makes web pages so much nicer to read. It also lets you organize by topic, save posts for later, and send posts to social media or article-saving sites like Instapaper or Pocket. The one issue I have is that it crashes occasionally. 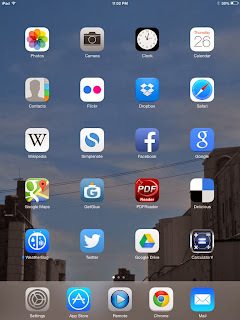 For saving articles from Twitter and Facebook, I like Instapaper. It has nice fonts and a soothing beige background and the Twitter app allows one-click export (sadly, not Facebook, but it's pretty easy to copy the link--Instapaper will automatically ask if you want to add the last link copied when you open it). Once articles have been downloaded, you can read them even if you don't have Internet access. Sadly, I am always behind in my articles, but that was true even in paper-&-ink days. For magazines, Zinio is good, and, depending on where you live, you might get free magazines with your library card. Again, it has a "text" button, so you can read uncluttered, then toggle back to the regular page view for all the shiny pictures. Well, this is getting a bit long, so I'm gonna continue this in another post. Feel free to post recommendations in the comments. You know how to pick em! The doubters can take a look at Bulgi the Tarsier if any reservations remain about the usefulness of the Mini as an art creation device . . .